Dr. Pratap Devkota earned his Ph.D in Weed Science at Purdue University. While working on his Ph.D, he worked as a Graduate Research Assistant for dissertation research which evaluated the influence of spray water quality factors on herbicide efficacy. Evaluating the interaction of foliar fertilizers with herbicide and the use of adjuvants for improving herbicide efficacy were also part of his Ph.D research. Additionally, Devkota received his MS degree in weed science from the University of Arkansas where he worked for weed management in vegetable crops. For his MS thesis, he evaluated the efficacy and economics of soil fumigants and herbicide programs as an alternative to methyl bromide for weed control in plasticulture tomato and bell pepper production. His undergraduate degree is in Agriculture Science from Tribhuvan University, Nepal. 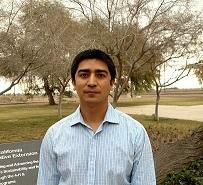 Pratap will serve as the UCCE advisor for Imperial and Riverside Counties specializing in weed science. He is located at the UC Cooperative Extension office at 1050 E. Holton Rd., Holtville in Imperial County. His primary research focuses wil include, but will not be not limited to, addressing the weed management challenges on agronomic and vegetable crops (alfalfa, bermudagrass, Sudan grass, wheat, cotton, sugarbeet, lettuce, carrot, onion, spinach, cole crops and cucurbits) grown in Imperial, Coachella, and Palo Verde valleys. Below in his contact information.